IHT: NWA still interested in merger. Right. A Reuters item from Friday offers up a factual error that betrays a very shallow understanding of the potential for airline “merger mania 2009.” The factual error doesn’t actually appear to be in the original Reuters piece (here as it appeared on Friday; if the error originally appeared in the Reuters item, then it has been corrected but not flagged with an erratum) but rather in a paragraph added in the International Herald Tribune‘s version of the story yesterday, here: “Other sizeable U.S. airlines that could potentially be involved in mergers are US Airways, Southwest Airlines, Northwest Airlines and Jet Blue Airways.” This assertion is based on what exactly? It’s not reported in the Reuters item, so I really have no idea why it was inserted. It’s as if some copy editor had a general idea of some U.S. airlines’ names and threw them in. I am amused by the inclusion of Northwest, a wholly owned subsidiary of Delta, in a list of airlines looking to merge. I am even more amused that the IHT has not had the good sense to correct this error on its site, and that Today in the Sky is uncritically citing the story. Way to go, news media! FedEx issued its first Global Citizenship Report Wednesday, touting plans for big cuts in pollution by jets and delivery trucks. . . . On the environmental front, the company aims to cut carbon dioxide emissions by FedEx Express jets by 20 percent within less than 12 years. FedEx fuel consumption of about 1.5 billion gallons last year ranked behind the largest passenger airlines, which put more flights in the air. Fuel was 12.1 percent of the company’s total operating costs in fiscal 2008. “We’re a large user of fuel, but we’re not the largest,” [sustainability director Mitch] Jackson said. No, but according to an interview with CEO Fred Smith in the Wall Street Journal, it’s the second-largest user of energy in the world — after the U.S. military. See comment below. To curb the appetite for oil, FedEx Express in 2005 set goals of a 20 percent reduction in carbon dioxide emissions by its jets and a 20 percent increase in fuel mileage for delivery vehicles. The report showed that jet emissions have been reduced 3.7 percent on a pounds-per- available-ton-mile basis in three years, while vehicle fuel economy is already up 13.7 percent. Key to the increased efficiency will be the replacement of its 90 727Fs with at least 87 757-200 converted freighters by 2016. The 757s will reduce “fuel consumption up to 36% while providing 20% more payload capacity,” it said. FedEx has been planning this fleet transition for years (with a focus on fuel and labor savings and increased medium haul capacity). How great for FedEx — they get environmental plaudits while doing exactly what they were doing all along. Unfortunately, this kind of reporting is par for the course at the CA, which years ago — through a series of redesigns and changes in editorial leadership — shifted away from serious reporting into local cheerleading, soft and fluffy features, and barely edited press releases. In other news: FedEx has a blog! Welcome to the aviation blogosphere! Airline passengers: down 1 million people, or 6.5 percent, to 16 million people. Road warriors: down 320,000 people, or 1 percent, to 34.4 million people. Amtrakkers: up 10 percent to a total of 322,000. Does that sound like “flocking” to you? 1,300,000 fewer people traveled on airlines and highways over Labor Day than last year, and the FT would have you believe that 30,000 more travelers on Amtrak constitutes a massive shift in mode preference. Outside of the dense northeast corridor, Amtrak is simply not a viable substitute for air and car. Its cross-country routes are too long, its schedules too infrequent, its destinations too few, and its delays too common. That’s not to say that some sort of high-speed rail system won’t work here–just that Amtrak ain’t it. The following post has nothing to do with aviation policy; it’s just a rant. This story came across my reader today. What’s wrong with the screen cap below? If that jet in the picture looks like it’s in Continental’s livery, you’re right. 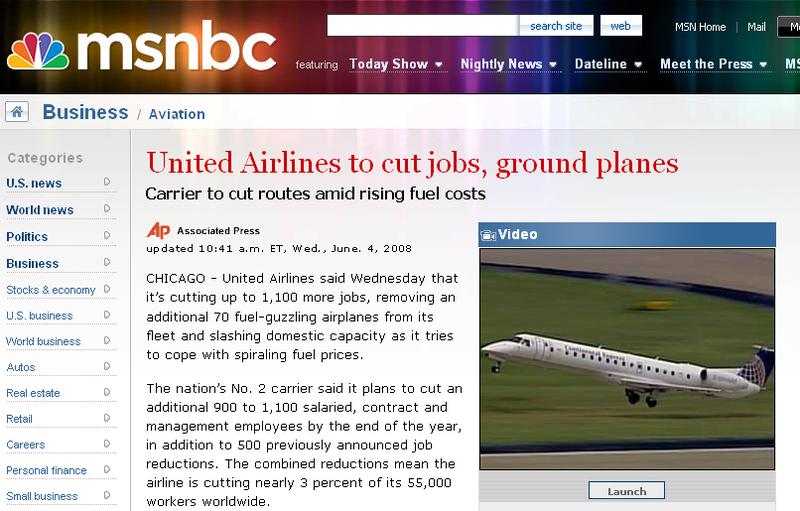 The editors chose the do a screen grab of a Continental aircraft on a story about United. Why? Beats me, but it seems to go along with a general illiteracy about commercial aviation in the mainstream media. I was once interviewed last fall for a segment on the Essential Air Service. The segment focused on flights at Washington Dulles Airport; all of the “b-roll” — the background footage that airs as people talk — came from Reagan National. But at least they shot the right airline. TV shows and movies get it wrong a lot, too, confusing airline liveries and aircraft types. A sitcom episode I saw not long ago, set in 2007, showed an establishing shot of the Delta terminal at New York’s JFK airport. The aircraft were L1011s and Boeing 727s — decked out in Delta’s mid-’90s livery — types Delta has not operated since 2001 and 2003, respectively. The worst offender in this category is the terrible short-lived sitcom The Loop, which focused on a young executive at a major airline. This show had every reason to be accurate; after all, it was about the airline industry. Instead, its understanding of the industry was juvenile, as if the writers merely skimmed a few newspaper articles. But its visual cues were much worse. It used footage of LaGuardia and Newark airports as establishing shots of Chicago-O’Hare. It would show a narrowbody plane in an establishing shot, then reveal a widebody interior — and vice versa. And no wonder the fictional airline was hemorrhaging money — they were, according to the show, operating 747s on domestic routes like Chicago-Denver! This is, of course, a trivial tip of the iceberg. Patrick Smith nearly has a full-time job pointing out errors in the mainstream media’s reporting of much more serious aviation issues. Rant over. Now back to your regularly scheduled wonkishness.